The temperatures were hovering at the zero mark, and our dining companions were ready to scrap our plans to head down to Requin at the District Wharf, in favor of staying closer to home. I had my heart set on Requin so that I could check off dining at another one of the flagship restaurants currently open at the new waterfront development. So while the high cost of parking there is justifiably one of the complaints, it’s a plus to be able to park in the lot on a frigid night, and brave the elements for just a few short steps. Requin is one of the newest restaurants from Mike Isabella Concepts. 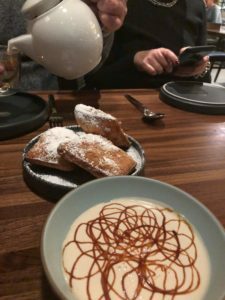 I’m a fan of the Mosaic District location, or I was when Chef Jen Carroll was in the kitchen, and it was still called Requin. She departed, and it’s now Requin Brasserie, to indicate a shift to more casual cuisine. But let’s get back to The Wharf. This location carries forward the upscale contemporary French concept of the original. Michael Rafidi does double duty as Executive Chef here and at the nearly year-old Arroz. The talented chef made a splash when the Spanish/Moroccan Arroz opened, and he’s a hit maker again at Requin. The restaurant’s visual appeal is inside and out. The boxy building is largely steel and glass, with “Requin by Mike Isabella” framing the entranceway in white neon lights. A vast open kitchen is flanked by tables and the bar. Handsome high-backed booths along one side of the restaurant are perfect for those times when hearing your dining companions is a priority. Most tables have a bird’s eye view of the bustling wharf- although it’s fairly quiet on a frigid night. As temperatures rise, an outdoor patio is certain to draw crowds. I only wish the restaurant design could accommodate large parties- there is only one table for eight available- and it’s been difficult to snag. The menu at Requin is segmented into sections of hors d’oeuvres, tartines, small plates, and entrees designed for sharing. Our server recommends that our party of four build a meal comprised of a couple of selections from each section of the menu. This is a no-brainer, and potentially annoying, if we weren’t won over by his sincere enthusiasm for the food. Thanks, Nick! We breeze through an order of fried pommes beignets, topped with aioli and oozing forth with warm raclette fondue. 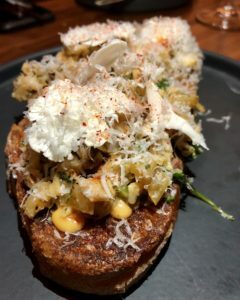 A tartine of smoky cauliflower florets topped with chili tahini, crème fraiche, and shards of parmesan is pleasant and well-suited for sharing. 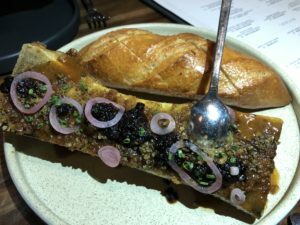 I don’t normally greet marrow bone with thunderous applause, but the Requin version, with au poivre glaze and bacon-szechuan pepper corn jam, is a lip-smacking delight. Washingtonian Magazine just named Requin #20 on its list of the 100 Very Best Restaurants 2018, writing ”it’s worth the trip for its roast chicken alone.” I have to return for the dish. My pick for a shared entrée is aged duck a l’orange ($45 and serves 2-3). 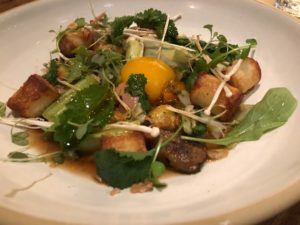 Chanterelle tarte with roasted sunchoke, swiss chard, and melted muenster makes for a lovely small plate, as does the cool combo of French gnocchi with egg yolk, root vegetables, bok choy, and truffle butter. What’s the point of eating contemporary French food without dessert? Rhetorical question. Creme brulee, donuts, and roasted pear with red currant sorbet and thyme whipped cream all round out the solid meal. I predict that Requin at the Wharf will continue its rise to success. Even with a serious chill in the air, braving the elements is well worth the effort.